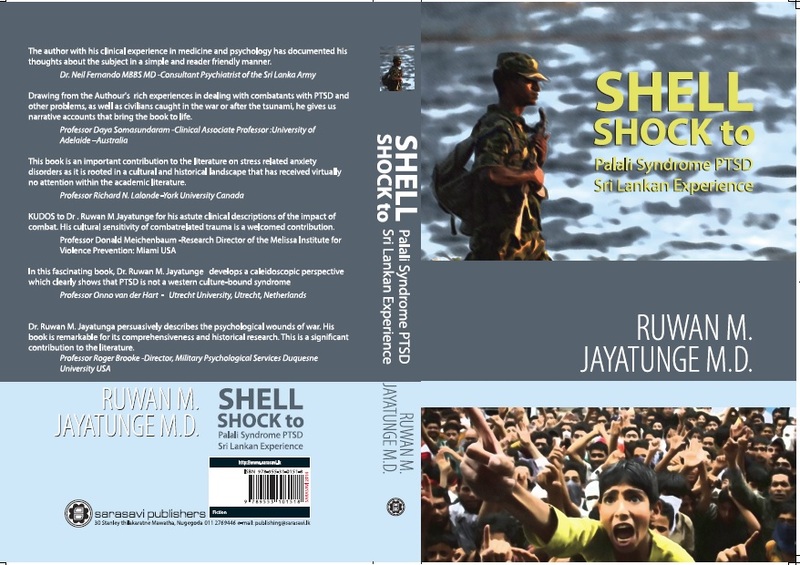 Dr Ruwan M Jayatunge’s newest book Shell Shock to Palali Syndrome- PTSD Sri Lankan Experience” (Sarasavi Publications -Colombo Sri Lanka) is a welcome contribution not only to the PTSD literature but also addresses a current problem facing Sri Lanka. After more than three decades of a devastating ethnic war and the legacy of two Southern ultra left rebellions as well as facing the massive Asian Tsunami of 2004, Sri Lanka is reeling from the after-effects of trauma. The book clearly describes the development of the concept of Post traumatic stress disorder (PTSD), early historical antecedents in Sri Lanka and then outlines current management strategies and evidence based treatment options. Commenting on this book Prof. Ivan Urlić, M.D., Ph.D., Neuropsychiatrist, group analyst, Medical School, University of Split, Croatia states: Shell Shock to Palali Syndrome- PTSD Sri Lankan Experience is an impressive endeavor to put together all experiences from different dramatic and tragic situations in war impacted society. This book is for me the monumental example of sufferings all kinds of disasters were tormenting people, leaving heavy consequences on actual and future generations. This takes the description and elaboration of all sufferings onto highest priority of mental health policy of Sri Lanka. Comparing similar experiences from other countries, former Yugoslavia included, it can be seen that all sufferings are on common denominator of human condition. In that way we can be compassionate with other human beings regardless of their cultural characteristics. This is of outmost importance when we are planning and organising help for these psychologically traumatised people, and our experiences on a professional level become comparable. Shell Shock to Palali Syndrome is a very powerful book on human suffering, either caused by man-made or natural disasters, that were overwhelming Sri Lanka during last several decades. The long shadows of traumatic experiences should be recognised and treated, because time proved not to be a general healer, it fails to heal all wounds. Dr Ruwan Jayatunge and his colleagues and teams are drawing upon their experience, knowledge and newly gained wisdom in helping traumatised people to mourn losses and to open up the processes of transformation from hatred and violence to empathy. The author with his clinical experience in medicine and psychology has documented his thoughts about the subject in a simple and reader friendly manner. Drawing from the Author’s rich experiences in dealing with combatants with PTSD and other problems, as well as civilians caught in the war or after the tsunami, he gives us narrative accounts that bring the book to life. The author concludes insightfully that although war ended in 2009, the psychological repercussions of the war have not. This book is an important contribution to the literature on stress related anxiety disorders as it is rooted in a cultural and historical landscape that has received virtually no attention within the academic literature. KUDOS to Dr . Ruwan M Jayatunge for his astute clinical descriptions of the impact of combat. His cultural sensitivity of combatrelated trauma is a welcomed contribution. Dr. Ruwan M. Jayatunga persuasively describes the psychological wounds of war. His book is remarkable for its comprehensiveness and historical research. This is a significant contribution to the literature.